Content is sufficient for use according to our recommendation for 86 day(s). 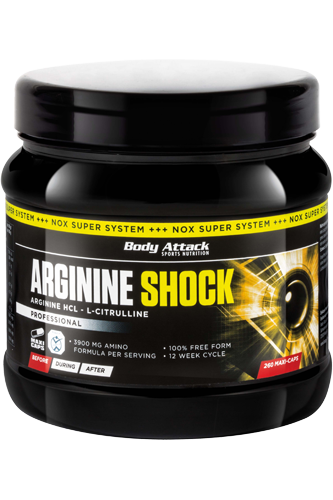 The Body Attack Arginine Shock capsules contain an amino acid supplement made of L-Arginine and L-Citrulline. Athletes and health-conscious people can take the amino acid supplement during physical exertion, because the amino acids play an important role in protein metabolism. This is because methyl histidine, a breakdown product of muscle fibres, is synthesised during intensive muscle training. This is converted in the liver to urea by using the amino acids L-Arginine and L-Citrulline and subsequently excreted through the kidneys. Body Attack Arginine Shock provides 3,150 mg L-Arginine hydrochloride and 750 mg L-Citrulline malate for the natural metabolic balance, so as to facilitate maximum performance of the protein metabolism and the urea cycle. These two amino acid compounds have good bio-availability in the energy and protein metabolism. Worth knowing: What is the function of L-Arginine and L-Citrulline in protein metabolism? At rest, the body synthesises and uses up to 75 g muscle proteins daily. In this metabolic state, the two basic amino acids are active in the urea cycle by helping in the detoxification of ammonia, which is excreted as such through the kidneys during protein degradation. At an increased urea cycle, the body has to synthesise more L-Arginine to eliminate the resulting metabolite ammonia. In case of shortage of L-Arginine supply, the kidneys can also synthesise L-Arginine from the amino acid L-Citrulline, thereby maintaining the natural metabolic balance of the proteins. Excess proteins from foods, such as meat, fish and milk are also decomposed by L-Arginine and L-Citrulline during protein metabolism. Thus, the body relies on adequate synthesis of L-Arginine, especially in the liver, as this is primary site of protein metabolism. Worth knowing: What is L-Arginine? L-Arginine is an amino acid, which the body can synthesise endogenously from the two amino acids, L-Glycine and L-Methionine, especially in the liver, intestine, and the kidneys. However, arginine is also referred to as semi-essential amino acid because in certain metabolic conditions, such as high intensity of physical exertion, stress, during a diet or build-up phase, the body cannot synthesise adequate quantity of this basic amino acid. The arginine rich foods include nuts, legumes and pork. In a one-sided, unbalanced diet or during a diet phase, the amino acid L-Arginine may be a useful supplement to the daily diet. Worth knowing: What is L-Citrulline? L-Citrulline is a naturally occurring amino acid that can be synthesised by human beings. Ingested with food, citrulline enters the bloodstream and is converted by the liver, and especially in the kidneys, to arginine, the precursor of the important neurotransmitter, nitric oxide. Which products can the Body Attack Arginine Shock be combined with best? With the Body Attack 100% Pure Creatine to raise performance during short and intense strength training. With the Body Attack Magnesium Shots that may contribute to the normal energy metabolism and normal muscle function. With the Body Attack 100% Pure L-Glutamine, which, like L-Arginine and L-Citrulline, is also involved in protein metabolism and the urea cycle.